There’s nothing like winter camping in Michigan. Once that first fluffy snow falls, we know it’s time to get out there. Beautiful white snow drifts make for lovely scenery on winter hikes, and there’s something very peaceful about camping in the wintertime; not to mention how rugged you feel after weathering two or three nights in below zero temps. If you haven’t seen Lake Michigan in the winter, this is the year to do it. There’s no better view of the frozen lake than at the Warren Dunes State Park campground. 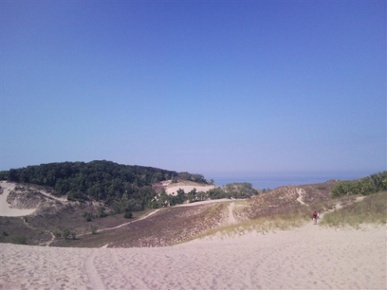 Open year round to campers and hikers alike, the Warren Dunes State Park is massive, with over 1900 acres of protected land, and six miles of clearly marked hiking trails. Set up camp, and then go head over to the sand dunes for a look at Lake Michigan. 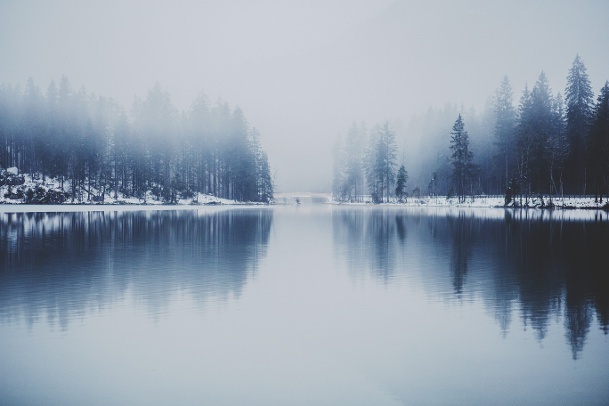 It’s eerie, frozen waves are sure to entertain, especially from such great heights. If you’re into winter sports, the park also has a popular cross country ski trail! To get to the state park from I-94, take exit 6, and then head east on Elm Valley Rd. for 2.5 miles to the park entrance. For information on booking a reservation, or to see what amenities they’ll have available, call (269) 426-4013. If you can brave the changeable Michigan winters enough to get up above the bridge, then you shouldn’t stop until you make it to Pictured Rocks. Quite a sight in the summer, the rocks stand out even more against the flat white background of winter. If you do any hiking around the cliffs, you’ll see massive, feet-long icicles hanging from the cliffs, and intriguing pancake ice in the water. Since the National Lakeshore is so large, you’ll probably have the whole campsite to yourself; not a bad way to enjoy nature. Don’t worry about the park closing, or winter camping restrictions. 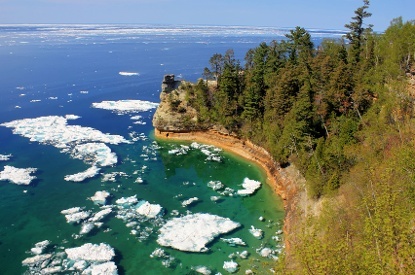 The Pictured Rocks National Lakeshore is very welcoming to backcountry campers and hikers. There are a few rules you’ll have to follow, but as long as you set up camp at least 100 feet from parking lots, rivers, and pathways, you should be good to go. If you’re looking for a good hiking trail, we recommend Chapel Loop. 10.4 miles long, this trail will take you past multiple waterfalls, and perhaps even more impressively, along the top of the cliffs for about 4 miles. Make sure to bring good hiking boots, and step with care, as the trail can get pretty close to the edge. To get to there, head east out of Munising for about 15 miles off Alger County Rd. H-58. Then head north on Chapel Road, until you reach the end. 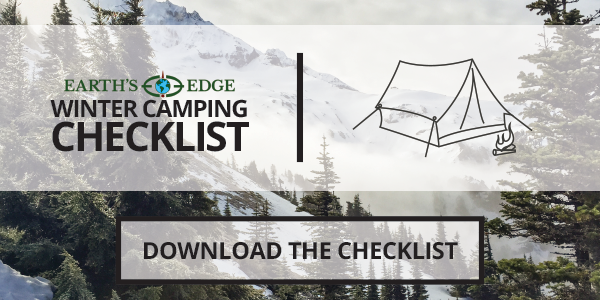 From there, it’s a 2.5 mile hike to the lakeshore, but you can set up your backcountry camp wherever is convenient for you, and abides by restrictions. If you have more questions, call the park at (906) 387-3700. 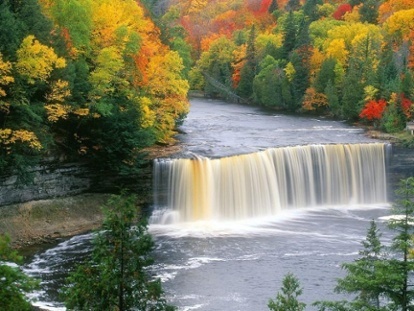 Famous for its fishing, the Jordan River was the first in Michigan to be named a National Wild and Scenic River. That’s a title that makes for a lovely hike. This two-day backpacking trip is one of the best around, offering views of a little bit of everything. You’ll see great wooded forests, some clearings and marshy areas, all topped off by the scenic outlook at Deadman’s Hill. If you plan on following the loop, you’re in for a great camp and hike, but you can always just hike part of the trail if you like. If you plan on staying overnight, most campers stay at the Pinney Bridge Campground, a nice quiet spot perfect for resting up after a big hike. We do like to warn hikers of the Jordan River Parkway that this isn’t your typical day hike. It’s a pretty strenuous hike, with all kinds of up and downs, and often soggy footing. Since the trail is 18.5 miles, you’ll want to plan enough time to be able to make it at least 10 miles a day, but most people do split it up into one 10.5 mile day, and one easier 8 mile day. Since you’re probably going in the winter, make sure to plan extra time into your estimated arrival time. The hike typically begins at the scenic overlook at Deadman’s Hill, just a few miles of 131. Located about 12 miles north of Mancelona, take 131 N until you get to Deadman’s Hill Rd. Turn west, and continue on Deadman’s Hill Rd. until you reach the parking area and trailhead at the end. For more information, and to make a reservation, call the DNR Operations Center in Gaylord at (989) 732-3541. Don’t worry about a lack of amenities here either. This part of Northern Michigan gets a ton of snowmobile traffic, so a lot of places including restaurants, will still be open for business, despite the feet of snow on the ground. An added bonus of the Tahquamenon Falls campgrounds is they keep their campsites plowed, so you can get in and out in the morning with ease, whether you’re camping in an RV or a tent. The trails around this campsite are established, and well marked. You’ll probably see plenty of snowmobile tracks as you hike around, but just make sure you watch out for any rogue riders. Since there’s not a lot up there, it’s pretty easy to find the falls, as long as you make it to M-123. In most cases, you’ll start in either Newberry, where you’ll head northeast, or you’ll start at Paradise, where the falls are just a short drive to the west. To book your reservation, make sure to call the local DNR office at 906-492-3415. For a truly unique winter camping experience, check out the Sturgeon Falls Campground, just 6 miles from Sidnaw. 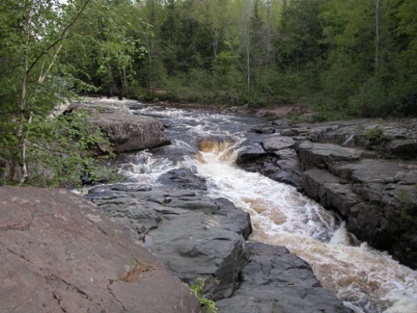 The Wild and Scenic Sturgeon River is one of the more exciting in the upper peninsula, crashing over the Sturgeon Falls until it flows into the Sturgeon River Gorge. 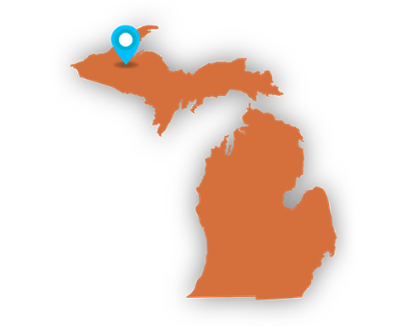 The gorge itself is unlike almost anything in Michigan, at 350 feet deep, and more than a mile wide, it’s a sight to be seen. The campgrounds are rustic, but open during the winter. You’ll want to call ahead of time to make sure you can get in, and make sure to check the weather. You never know when a road may be drifted over in the U.P., blocking your passage to the campground. Once you reach the campground, it’s mostly backcountry hiking for you. While the area does have a few marked trails, they’re not well-travelled, and even harder to find in the winter. So make sure to bring your GPS device, and plenty of food and water. This is a great trip for the experienced winter hiker, full of beautiful scenic views, waterfalls, and miles and miles to roam. It’s likely that you’ll be the only ones out there when you go, which makes for the perfect winter camping trip. To get to the campgrounds from Sidnaw, take M-28 east out of town. When you reach FR 2200, turn left. 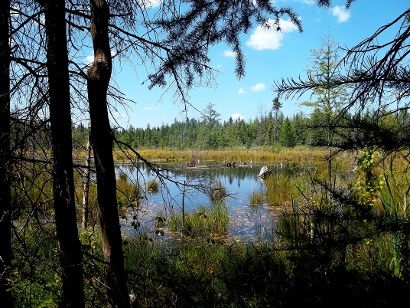 Continue on the road for about 11 miles, and then veer left on the east edge of the Sturgeon River Gorge Wilderness. Look for the campground or trailhead sites, as these are the best places to enter the Wilderness. The best part about this campground is that you don’t have to make a reservation. To check out their few rules and regulations, make sure to head to their website, linked above. 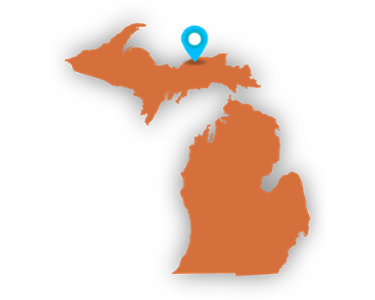 We hope our top 5 Winter Campsites in Michigan satisfy that urge to get out of the house this winter! We always remind you to call ahead to any campsite you plan on staying at, to ensure you have the proper permits, and to double-check that the campgrounds will be open. 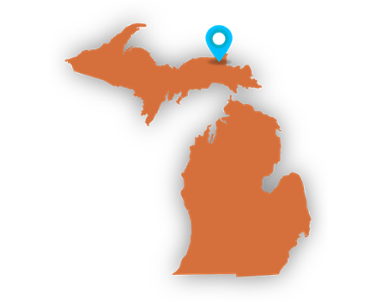 Michigan has never been known for predictable weather, so always be prepared for a snowstorm, and for roads leading to your destination to be closed.